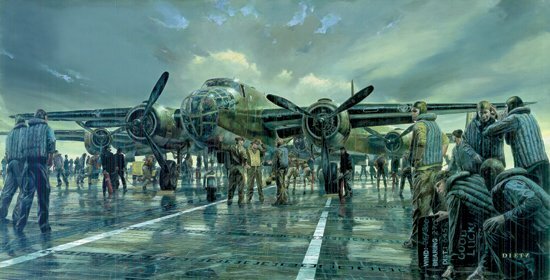 Image Size: 28" x 14.5"
Paper Size: 24" x 21"
Colonel Doolittle and his co-pilot, Lieutenant Richard E. Cole, who were to be the first to take off their B-25's, discuss last minute instructions with Lieutenant (U.S.N.) Edgar Osborne, who was to be Launch Officer for the take-off. Other Army personnel scramble to their planes while USS Hornet Navy deckhands man their assigned positions for one of the most famous carrier launches in history.